Native-born Austrian, Nora Pouillon, is a well-known restaurateur in Washington, D.C. and the owner of the first certified organic restaurant in the United States. Pouillon has been a strong advocate of the organic food movement and of sustainable living for the past 30 years. She has influenced others about the rewards of eating organic local nutritious food and created a close network of farmers who shared her beliefs and supplied her with their products. Over the years Pouillon introduced chefs to local farmers, helped an organic farmer’s co-op to be successful and initiated the producer-only farmers markets in the D.C. area. Through her speaking engagements and her participation on several environmental boards she educates the public about the importance of organic food for their health and that of the planet. Pouillon initiated the organic movement on the East Coast and as it grew, her own initiatives grew exponentially, and earned her many honors and accolades. In March, 2009, the Environmental Film Festival in Washington, D.C. featured a documentary entitled, “Nora!,” documenting her tireless efforts. Nora Pouillon came to the United States in 1965 at the age of twenty-one with her French journalist husband. In those early years a modest budget compelled her to learn to cook and share meals with her friends. This eventually led to her opening a catering business and cooking school. While searching for fresh, locally grown products for her business, she discovered they were not readily available in the supermarkets. She then began to visit farms in the region, searching for fresh, high quality meat, fruits and vegetables, which she could offer in her business; in essence, food that was organically grown and did not need to be transported thousands of miles across country before reaching its consumers. Those visits resulted in questions concerning the prevailing agricultural practices and to the eventual realization that the use of chemicals dominated conventional farming and the food industry. The treatment of farm animals with hormones and antibiotics, and plants and grains with synthetic fertilizers, herbicides and fungicides had usurped the production of natural foods. She not only bought the products from the few organic farms that existed in the region but coached the farmers to grow particular crops. Eventually, these farmers formed a co-operative, the Tuscarora Organic Growers Co-op (TOG), which she introduced to other chefs in the D.C. area and therefore they are now a great success. Pouillon initiated Freshfarm Markets the first producer-only farmer’s market in Washington, D.C. Inspiration came from the impressive open market at Union Square in New York City. The underlying concept was to connect consumers with local farmers and food sources and to encourage interest in where and how food is grown. According to Pouillon, “when one sees what the farmer grows it’s educational, it makes people happy and it keeps them healthy.” Meanwhile, there are now eight such markets throughout the urban area. In the belief that sustainability can best be achieved through education, Pouillon worked with the United States Department of Agriculture (USDA) to introduce a healthier school lunch program. She went to local schools and spoke to children about the importance of fresh food and demonstrated healthy recipes. She also encouraged schools to plant their own gardens to teach children how food is grown. Her crusade for a better quality of life is ongoing. The idea of an organic fast-food restaurant chain to prove that one needn’t be rich nor privileged to eat healthier continues to germinate. Pouillon admits that the evolution of a return to natural organic foods is a slow process and is consumer-driven. Today’s consumer will give the movement impetus once educated about its rewards. In the meantime, what better advocacy tool for educating others than through her restaurant, Nora, which has been in business for 30 years and offers a menu that is at least 95 % certified organic. Born in Vienna in 1943, Nora Pouillon came to the U.S. in 1965 and opened Restaurant Nora in 1979. In 1999 Nora became the first certified organic restaurant in the country. 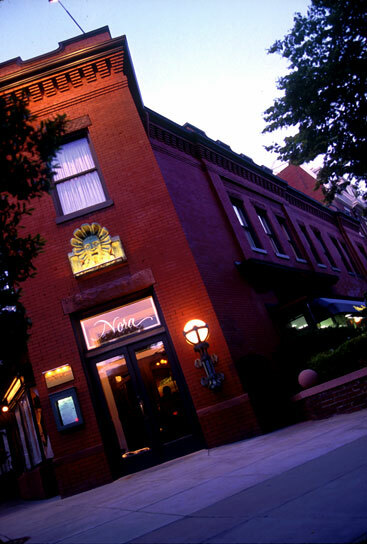 Health Magazine named Nora one of the “Top 10 Healthiest Restaurants.” Her many achievements include recognition as Chef of the Year – Award of Excellence by the International Association of Culinary Professionals, founding board member of Chefs Collaborative 2000, consultant for Whole Foods Market, author of “Cooking with Nora,” national spokesperson for the 1998 National Food Safety Education Month, leading spokesperson for the NRDC/SeaWeb “Give North Atlantic Swordfish a Break” and “Pass on Chilean Sea Bass.” Nora Pouillon most recently received the Mayor’s 2009 Environmental Excellence Award.